A Visit to The White House. Even after all these years as a certified master chef (CMC) and the corporate chef at Delaware North Companies, I still get excited when I travel to new places and meet incredible people. 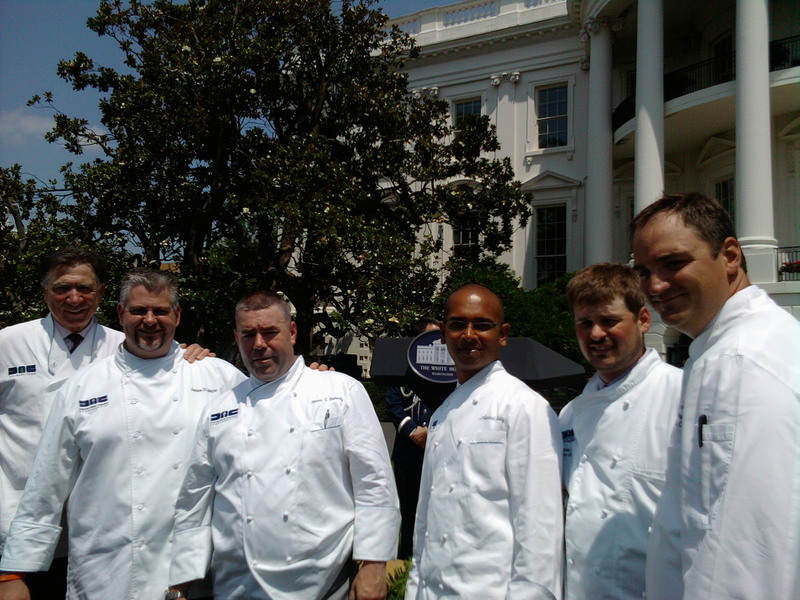 That’s exactly how I felt last Friday when I and five other Delaware North chefs visited the south lawn of the White House and met First Lady Michelle Obama. There are still moments that make my stomach flip and flop and this was one of them. 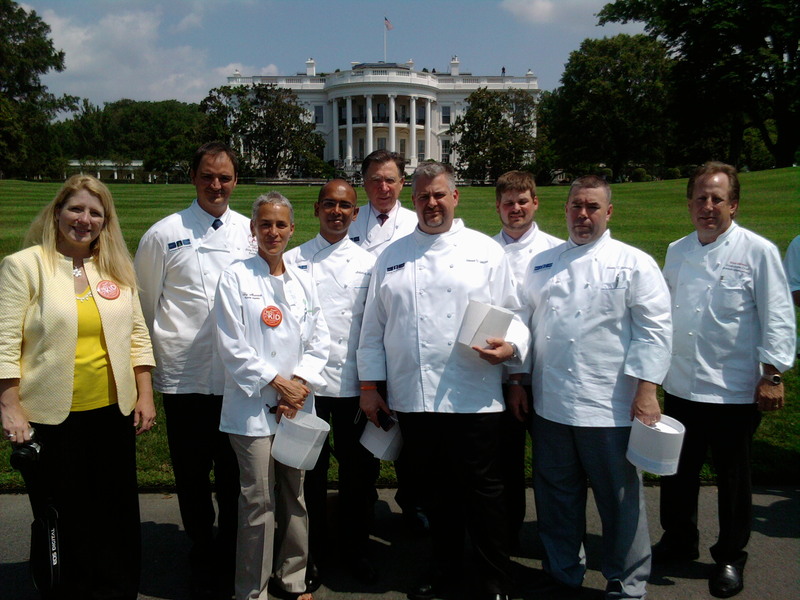 The six of us had come to the White House to participate in the launch of the First Lady’s Chefs Move to Schools program, a call to action to chefs to partner with schools to provide nutritional information and cooking advice to schools, educators, parents and children. I have been asked to lead this effort for our company. I must say I am honored. I have several passions related to cooking and teaching and I will take great pride in working through this Chefs Move to Schools program to help fight childhood obesity across our country. I firmly believe if people understand more about where their food comes from and how it is prepared, they inherently will make healthier decisions. 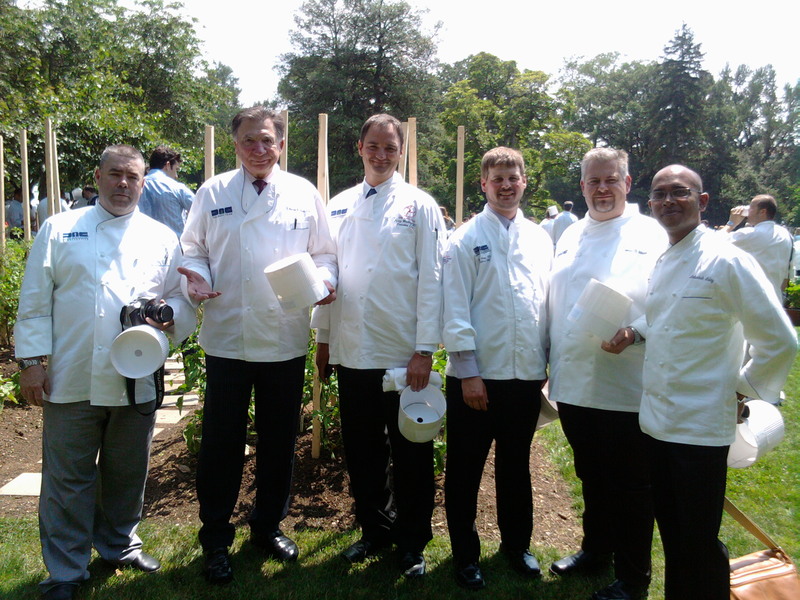 The event was extra special for me as I was able to share it with my “gang.” Also at the White House with me Friday were Sportservice Regional Executive Chef at TD Garden Kevin Doherty; Sportservice Regional Executive Chef at Progressive Field James Major; Parks & Resorts at The Ahwahnee Executive Chef Percy Whatley; Gaming & Entertainment Executive Chef at Fairgrounds Gaming & Racing Scott Green; and Sportservice Executive Chef at PETCO Park Ambarish Lulay. Delaware North Companies Vice President of Corporate Communications Wendy Watkins and Great Performances CEO Liz Neumark also joined us. Both of them are very passionate about the childhood obesity issue in our country and working to stop it through their professional endeavors. As you can imagine, it was a special event for me and everyone in attendance. It is just the beginning of what promises to be a great initiative in our nation’s schools. I have posted a few pictures below, but also, you should read the accounts of others here and here. I am stronger with food and cooking than I am with words. Alright, now it’s back on a plane and back to work. This entry was posted on Sunday, June 13th, 2010 at 2:00 pm and is filed under Uncategorized. You can follow any responses to this entry through the RSS 2.0 feed. You can leave a response, or trackback from your own site. One Response to A Visit to The White House.